Back when Grand Theft Auto V was originally released, one particular theory about race started floating around. According to some players, the cops in GTA didn't treat all of its protagonists the same. Some players thought that Franklin, the African-American character, got racially profiled by cops. 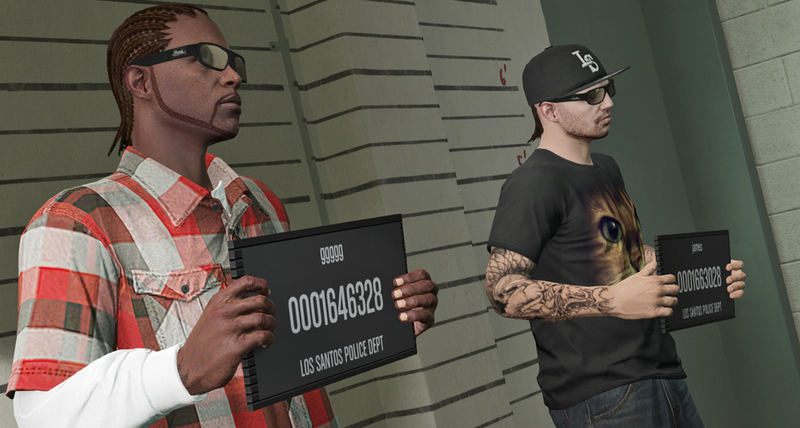 At the time, Rockstar denied allegations that GTA cops were programmed to be racist. "This is absolutely false, the in-game police don't treat one lead character any differently from the others," Rockstar said to Buzzfeed. Not only that, but most of what people were saying about GTA cops was anecdotal, or descriptions of one-off incidents where cops arrested or killed Franklin more than the other protagonists. It wasn't really enough to prove anything, even if the theory did make for some ridiculous YouTube videos of overly-aggressive cops. But today, The Game Theorists tried to test out people's claims by setting up an experiment, in an effort to pool data. To conduct the experiment, The Game Theorists dressed the characters in neutral clothes, and brought them to three separate police stations all across Los Santos—Vinewood Station, Paleto Bay station, and South Los Santos station. Each character went up to the cops individually, and spoke to them five separate times in each of these police stations. They recorded the results. Additionally, they also ran a set of tests where each of the protagonists went up to the cops in a car and honked at them five separate times, while recording those results as well. Then, to have a control group, they also did a run where they brought each of the characters near the cops five separate times, without provoking them, just to see what they'd do. That said, at the end of the video The Game Theorists make sure to say that their experiment doesn't prove that GTA V cops are racist. It might've just been random chance that made the results happen like this. But, even so, this experiment is way more formal than the anecdotal 'evidence' that people relied on to make their conclusions before. Correction: initially this article put up a screencap of the results from one particular station, not all three. We've amended this with the correct tally.